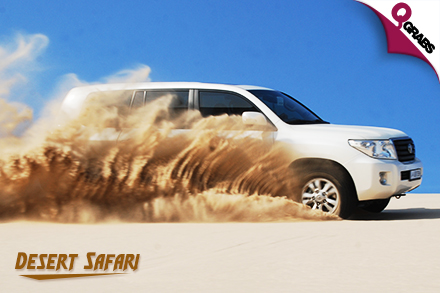 Valid for one half day desert safari between 12 Sept. 2016 – 16 Sept. 2016 for an Eid adventure! Includes a pick-up from Family Food Center near the Old Airport at 2pm to Sealine Resort, where the desert adventure begins! See unique and lovely views of Inland Sea near the Saudia Arabia border and Sealine Beach too! Half day desert safari lasts from 2pm – 6pm for a chance to see the sun set too! 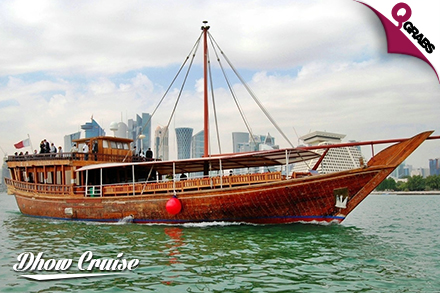 Cruise around the Corniche & West Bay in a traditional Qatari wooden Dhow for your Eid holiday! See the beautiful Doha skyline while you enjoy music and a BBQ dinner under the moonlight! Dhow picks up the passengers at 5pm and returns back to the dock at 9pm! Includes water & soft drinks with bathroom facilities, life jackets & life insurance coverage! See below for example of menu! Whether you want to take to the salt sea or the sea of sand, Inland Sea Adventures has you covered! Bummed you didn’t plan a vacation for the break?! NO WORRIES – we’ve got some fun close to home! Get out and explore your home with 50% off! Promoting Qatar culture and heritage, education, sports, environmental tourism sites. We offer the best rates of almost all tours, hotels and apartments in Qatar. We are constantly working to improve our current services along with it expanding to other parts of the Arabian Gulf.